Tours & Tastings are offered 7 days a week between 10 a.m. and 4 p.m.
O'Shaughnessy Estate Winery is a small, family-owned vineyard and winery on Howell Mountain in California's Napa Valley. Our quest to make two great Cabernet Sauvignon wines, is the driving force behind all of our growing and winemaking decisions. Because we are committed to excellence and believe outstanding Cabernet Sauvignon is made in the vineyard, we spent nearly seven years finding the perfect piece of land. The 100 acre estate consists of 37 planted acres. These acres have provided us with the red, rocky, well-drained soils and south facing slopes where we grow the Cabernet Sauvignon grapes and other Bordeaux blending varietals for our wine. The vineyard was planned, planted and farmed under the guidance of our winemaker, Sean Capiaux. Tasting are primarily conducted in the winery. 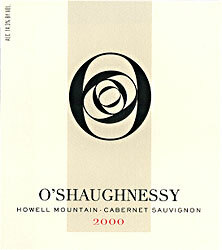 To join the wine club, visit www.oshaughnessywinery.com or call 707-965-2898.